Rolf and Daughters only reserves a portion of the restaurant, walk-ins are encouraged. If a reservation in unavailable please call the restaurant for more details on our walk-in availability and wait list option. Stellar experience with exceptional food and service. The Scottish fellow was a fantastic server! The pace was perfect. Don’t miss the short rib and the sweet potato...and the 97 Marcon! The food was delicious as always and the bartender made us a dealer's choice rum cocktail which was FANTASTIC. Always a go to spot for me! We celebrated my sister’s birthday here. We’re from Minneapolis,and this restaurant was recommended by a reviewer in our city paper who had visited Nashville. We ate outside because it was quieter. When I made the reservation, I mentioned it was my sister’s birthday. Her menu had a birthday greeting for her! The cocktails were excellent. Our waitress, Erica, thoroughly explained the menu and helped with our choices. The homemade pasta dishes are outstanding. I am so thankful to the person who reviewed this restaurant. He was spot on! Loved this restaurant. They use different ingredients, but it all comes together very well. Pasta dishes are outstanding. Good food, good service. Overall very good. Food was the best I had in Nashville. Innovative cuisine, outstanding service made for a memorable dining experience. We were visiting from out of town and had one evening for a "fancier" dinner. I scoured the listings and read many reviews and settled on Rolf & Daughters- it did not dissapoint! Particular highlights were the pasta (squid ink was divine) and an extraordinary beet dish. Our server was attentive without being overbearing. By the time we left dinner (nearly 10 pm) the restaurant was still crowded. It was on the louder side and packed pretty full. Overall, highly recommend! Always a hit. I love that the servers are so knowledgeable and professional. The taste combinations and ingredients are always spot on. Our favorite Nashville dinner choice. Food was great, Patric our waiter was fantastic. Very noisy and we had a 15 minute wait for our reservations. 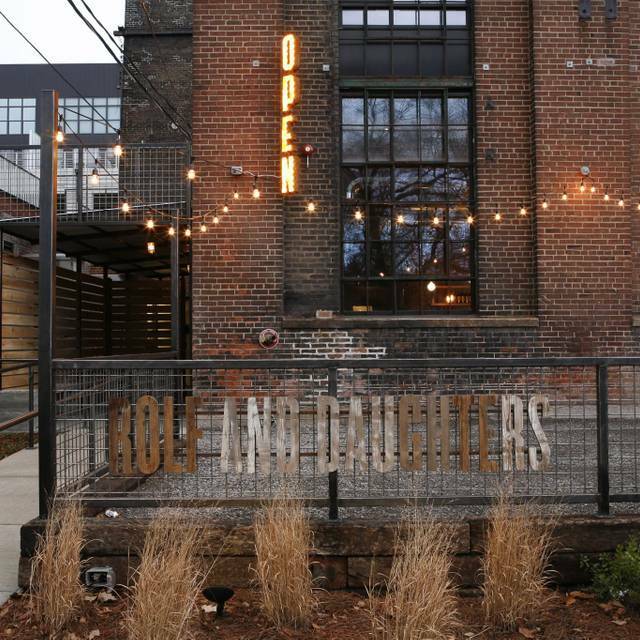 I had read about Rolf and Daughters on numerous sites and how it was a must-try for the Nashville area. I could not agree more because the food was delicious and the service was outstanding! Their homemade pasta is not to be missed. Definitely make a reservation in advance though because we saw people waiting for at least an hour to get a table. Having heard great reviews by coworkers, my wife and I visited on 8/19/2017. The menu had a great selection. The ingredients were creative and worked well together. Our server knew the menu in and out and had great recommendations. Our cocktails were prepared perfectly and tasted great. I would highly recommend Rolf and Daughters to anyone looking for a great dinner out. Attractive dining room, good service, but we felt ripped off with the food. The food was good, not great, & sparse for the price. $26 for a single pork rib with 4 bites of meat on it and a 1/4" thick slice of very fatty pork loin? Oh, yeah, there were 2 baby carrots on the plate, too. Skip it for an experience commensurate with the price. This has to have been one of the most delicious meals we've ever had. Loved the chicken liver appetizer!! Food was okay. This is the second time that I have eaten at Rolf and Daughters. I have expected the food to be great both times I dined. It was only good. Nothing catastrophic, just nothing stood out. The dishes were uninspired. The cocktails were good. The service was poor. I ate solo. The table next to me had explanations of the menu, while I was just handed the menu with no further talk. When I asked about the menu the waitress seemed put off by any questions. Overall I felt like leaving as RAD was just inhospitable. In this case two strikes and your out. The place was packed, but there are better places to eat in Nashville. Good service. Best meal ever, but very small portions. Although there is no guarantee with reservation requests, a bit disappointed that we made a reservation, asked to be outside, but when we arrived it would be 30 minute wait until a table outside would come open. Went with inside seating and our group of four was seated at a community table...was there to celebrate our 30th anniversay with our children. Easily our best meal in Nashville. Get the chicken and try as many pastas as poasible. Stopped in for dinner and had 2 of the best pasta dishes I've had in a long time. The Sweet corn agnolotti and garganelli were excellent. The waiter recommended them both and he was right. Great looking place with solid service. Elf food. The tiniest portion of delicious pasta. Even had to pay for bread and butter. We're starving when we left after a 70 dollar tab. Simple, yet deliciously well prepared food. The variety was nice, although I missed having a seafood option. The price point was fair and there was no pretension involved in it. The space was smallish and warm, but if you are looking for quiet and romantic maybe choose differently. We had reservations early, but chose to sit at the bar, because our table was not at all private. We really enjoyed the bar seats and the bartender's service all around. We tried a number of dishes and would return again. Great food in a great atmosphere! Chef creations are truly remarkable, with tremendous creativity and flavor even with simple dishes. First time customer, somebody recommended me this restaurant. The location and atmosphere was good. Tap water served hot not cold. Little food in the plate for the price. The taste of the food was overall good. I was not really impressed. Excellent service and food! Very creative menu options and every bite was tasty. 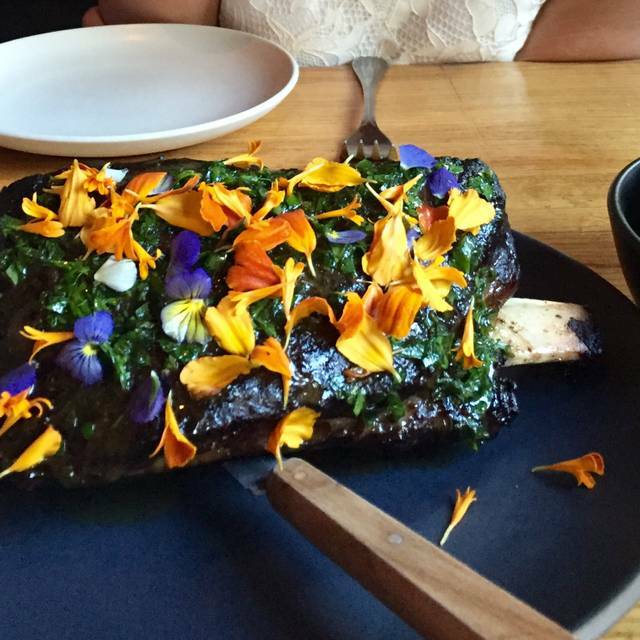 We shared a few plates, and really enjoyed the short rib..it was the most colorful entree I've ever had. Delish! I travel a lot and love to eat at great restaurants and Rolf and Daughters is literally in my top 5 fav restaurants, EASY. The food was just incredible, can't wait to go back, this menu is truly an experience. Atmosphere was intimate yet friendly and approachable/comfortable. Server very knowledgeable and helpful yet kept a good pace and rhythm instead of being in our face all night. Our new favorite Nashville restaurant. One of the best the city has to offer. Friends from NYC were visiting in Nashville. On our last night we went to R&D and had a simply perfect meal. The chicken liver pate exploded with amazing flavors in our mouths, the squid was perfection and the pasta was heavenly. Such a lovely and memorable meal. This was my first time to Rolf and Daughters and I am a vegetarian and I was very pleased to have the option of a Vegetable Plate made by the Chef and it was very good ! The experience was great - the food was spectacular and the service outstanding. With the sole exception of the hostess who was a bit rude and clearly stressed but the food and ambiance made up for it. Try some of everything - the pastas are unreal; handmade and brimming with flavor. The corn ravioli in particular is outstanding. The portions are small so good for sharing - over order and you will be happy! We had an excellent meal. Everything we ordered was on point and the staff was awesome! We Had a splendid meal and an overall great time. Our server went over and beyond assisting with food choices and taking good care of us. Our server was amazing!! We had a person with very specific food restrictions and he was amazing at handling all her questions! The food was delicious! Always exciting for the foodie. some changing menu and some constant staples. one of the best in Nashville! Our favorite place to dine in Nashville. Consistently amazing, and the best waits staff!